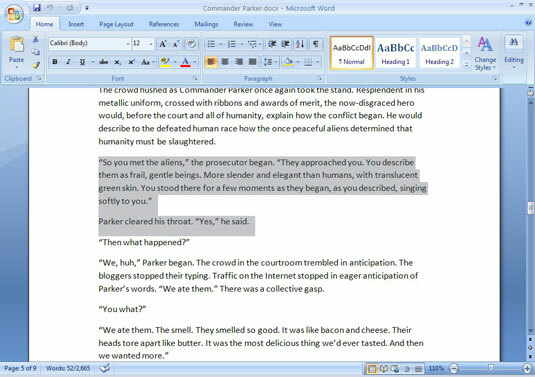 You can use the computer mouse to select text in Word 2007. All you need to do is click a number of times or use the point-and-drag technique. 1Point the mouse at the beginning of the text block and click. Clicking in this step anchors the insertion pointer. 2Drag the mouse cursor over the text you want to select. As you drag, text becomes highlighted, or selected. 3Release the mouse (stop the dragging) to mark the end of the block. You can follow these steps to select any size of block in your document.